French or Le Puy lentils are known for their mild, floral flavor. These tender gems get tossed into a bed of fresh baby spinach, and the goal is to wilt it ever so slightly. The roasted vegetables are a hearty addition, but we think the raspberry chipotle vinaigrette really pulls it all together while adding just a touch of spice. Preheat oven to 400°F. Combine the Le Puy lentils and 1 ½ cups water in a small saucepan and bring to a boil. Cover, reduce heat to low, and simmer until the lentils are tender and all of the water is absorbed, about 15 to 20 minutes. Peel and cut the golden beet into ½ inch thick wedges. Peel and chop the carrot into rounds. Peel and chop the parsnips into rounds. Halve the radishes. Transfer the vegetables to a baking sheet and toss with 1 tbsp vegetable oil and a pinch of salt and pepper. Roast until browned and crisp in places, about 18 to 22 minutes. Place a small skillet over medium heat and add the walnuts. Toast, shaking the pan frequently, until fragrant, about 3 to 4 minutes. Combine the raspberry preserves, champagne vinegar, a pinch of salt and pepper, and as much of the chipotle morita powder as you’d like in a medium bowl. Whisk well while drizzling in 2 tbsp vegetable oil. Taste the raspberry chipotle vinaigrette and adjust seasoning with salt. Add ¼ tsp salt to the cooked lentils and stir to combine. Add the baby spinach and cooked lentils to a large bowl. Drizzle with half the raspberry chipotle vinaigrette and toss well to combine. 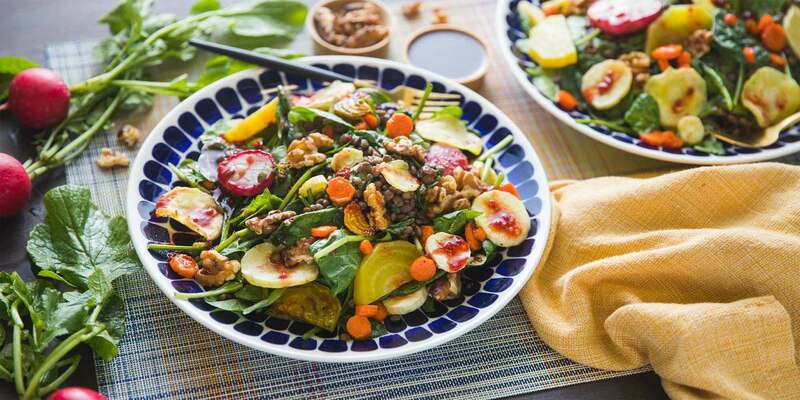 Divide the warm spinach and lentil salad between large plates and top with the roasted vegetables and toasted walnuts. Drizzle with any remaining raspberry chipotle vinaigrette.